There’s nothing like ballet for revealing the astonishing beauty of disciplined athleticism. 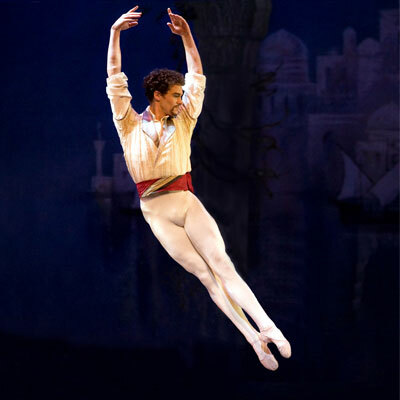 Take, for example, the ABT’s performance of Le Corsaire tonight at the Kennedy Center. In Act II, our eponymous pirate hero hides out in his grotto with his slave and his captured Greek girl, both of whom (thanks to the inevitable logic of ballet) proceed to dance a pas de deux with more leaps and spins than any other that I know of. It’s incredible. Here’s a clip of the pas de deux — it’s out of context (looks like a concert or something rather than the full ballet), but the male dancer is the same as I saw tonight, and he’s amazing. The best parts are at approximately the 4:00 and 7:30 marks. Here’s another clip — it’s the same production as I saw tonight, but with different dancers. The slave’s solos are at 1:20 and 4:40. I saw the performance with Amy and Anna and, fortunately, we had really good seats. Right down in the front orchestra, slightly to stage left. Probably a little too close for the stage makeup to be believable (seriously, it looked like a bunch of twelve-year-olds had drawn on their beards with Sharpies), but just right to appreciate those outrageous legs.